Optimized Toric Lens Geometry™ – delivering exceptional vision for your astigmatic patients. Featuring the same technology as our leading monthly replacement contact lens for astigmatism, Biofinity® toric. The science behind unsurpassed comfort. 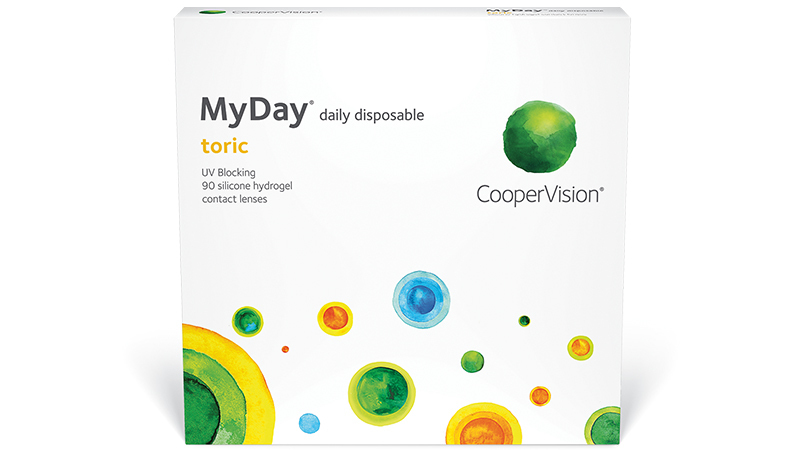 MyDay® toric lenses deliver an exceptional patient experience. The technologically advanced silicone channels in the MyDay® material transport oxygen so efficiently that less raw silicon is required. This sustains inherent wettability and facilitates optimal water content. To help support ocular health, MyDay® toric lenses have built-in UV protection** which filters 85% of UVA and 96% of UVB rays. 1. Manufacturer stated oxygen transmissibility values (Dk/t): MyDay® (100), 1 day ACUVUE® MOIST® (25.5), DAILIES® AquaComfort PLUS® (26), SofLens® daily disposable (24).